The Huh? 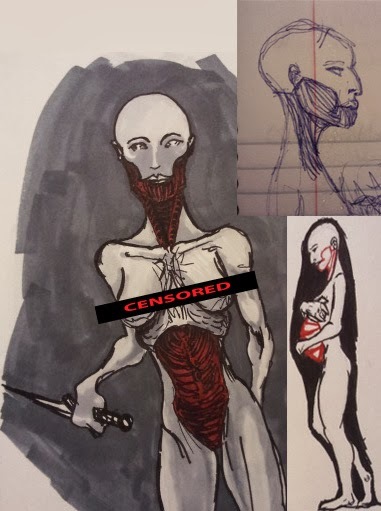 : Old Sketchbook Pages: Project Homage: "Siren"
Here is the first character sketches I found. I had her code-named "Siren." Simply a placeholder name at the time, because she used a form of hypnotic singing to lure in victims. Her tale was set to be quite sad- she was genetically engineered to be a sort of human/mosquito hybrid- a vampire of sorts. When she feeds it expands the thorax/belly section for digestion and protein conversion to reproduction- laying eggs. Unfortunately, she was also created sterile. At some point a group finds her singing dirges over her nest of eggs and they try to assist in a kind of rehabilitation. Bringing her in to get help and be admitted to an Intergalactic Swat Team- made up of other members and oddities that she would feel at least somewhat at home with. It would, in essence be universal misfits grouped together because of their outcast natures- picked up and trained by a strange section of military that would, of course, pose it's own threats at a later time.